A classic collection of items comprising subtle silken effect metal plating, mixed with faceted crystals and metallic-net over-lays. Available in 12K gold or rhodium plating. Rhodium plate gives a darker silver colour that doesn't tarnish unlike traditional 925 sterling silver plates. The Bohm Eternal Attraction multi-strand necklace. The various panels (round and angular ellipse shapes ) are fixed and appear to float on fine tiger-tail cords. Tiger tail is a twisted metal cord within a flexible acrylic coating. Adjustable length 16 inches/40.5cm up to 19 inches/48cm. The Bohm Eternal Attraction crystal drop necklace. The various panels (round and angular ellipse shapes) are strung to the front panel so will move and lie flat against the skin. Front drop approx. 6cm/60mm. Adjustable length 16 inches/40.5cm up to 19 inches/48cm. The Bohm Eternal Attraction stretch style bracelet. The panels sit flat against the skin. Stretches to fit most wrists comfortably. The Bohm Eternal Attraction crystal drop earrings. Pierced ears. Post with backing style. Length 4cm/40mm. 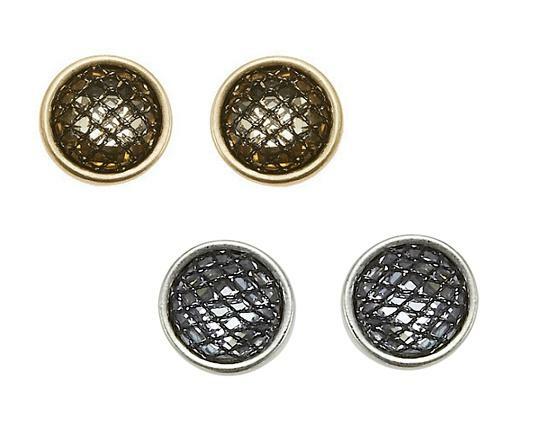 The Bohm Eternal Attraction crystal stud earrings. Pierced ears. Post with backing style. Approx. 1.3cm/13mm diameter.